By Gordon Lubold, The Wall Street Journal. Hostile forces in the Middle East are targeting American pilots with laser pointers at a growing rate, imperiling aircrews and reflecting a problem more widespread and longstanding than the Pentagon has previously acknowledged. American pilots operating in Syria, Iraq and Afghanistan, the three most prominent conflict zones for American troops, experienced most of the more than 350 lasing incidents reported over the last seven months by aircrews operating across the Middle East, officials at U.S. Air Forces Central Command in Qatar said. That is a significant increase from the approximately 400 lasing incidents reported for the region during all of 2017, according to officials, and marks an upswing after a decline in recent years. Lasing attacks appear to be an easy way for enemy combatants to harass and try to distract military pilots, both in planes and helicopters. [post_ads]The rate of lasing incidents so far this year is on track to top the roughly 600 incidents reported in 2016 and match 2015, when there were a total of about 700 incidents in the Middle East, according to officials. The numbers of lasing incidents had not been previously disclosed. The Pentagon earlier this year acknowledged a spate of attacks in two other regions. Several incidents occurred in and around an American base in Djibouti in east Africa, where laser beams appeared to come from a nearby Chinese base. A handful of incidents took place in the East China Sea, where U.S. pilots were hit by laser beams that may have come from Chinese personnel or from fishermen operating in the area, according to U.S. military officials. China has denied involvement in the incidents. Those incidents accounted for comparatively fewer attacks than in the Middle East. The number of incidents may be related to the frequency of U.S. military aircraft operations, officials said. Flight operations against Islamic State in Iraq and Syria and against the Taliban in Afghanistan have grown more intense in recent years. Hostile forces typically point small, hand-held lasers at pilots in flight, especially during landings when they are most visible from the ground, in an attempt to distract them, officials said. Such lasing could result in an accident, though officials said there haven’t been any mishaps as a result of lasing. It is unknown how coordinated or organized the attacks are: officials declined to discuss specific details about the perpetrators. The attacks against military crews have resulted in minor injuries, including short-term vision impairment and headaches, military officials said. Officials said they were not aware of any permanent injuries resulting from the attacks, most of which occurred near major population centers or military air bases in Iraq, Syria and Afghanistan. “Lasing attacks are dangerous and have the potential to confuse, temporarily interfere with the vision of our aircrew, or to permanently damage the eyesight of our service members,” said Capt. Bill Urban, a U.S. Central Command spokesman, in an email. Central Command is responsible for U.S. military operations in the Middle East. In many cases, American aircrews take off and land aircraft in places that aren’t accessible to enemy forces, but lasers are a relatively cheap and available weapon used to harass aircrews from afar, even thousands of feet away, officials said. Lasing attacks have long been a nuisance for commercial pilots. The Federal Aviation Administration reports thousands of lasing incidents each year, which can range from individuals using small “cat lasers,” or in some cases, more powerful “military grade” lasers. The FAA reported more than 2,800 lasing incidents in the first six months of 2018, about on par with the more than 2,700 reported incidents between January and June 2017. Since 2004, there have been at least 55,000 lasing incidents reported by civilian pilots including in the U.S., United Kingdom, Australia, Italy and Canada, said Patrick Murphy, a laser expert and editor of laserpointersafety.com, an educational site that tracks the misuse of consumer-type lasers. Of those, he said, “there are no documented or proven cases of permanent case of eye injury,” Mr. Murphy said. But aiming lasers at pilots raises a number of concerns, including “flash blindness,” which can be produced by a small, hand-held laser as far away as a mile, Mr. Murphy said. Lasers can also cause pilots to experience vision-blocking glare up to 5 miles away, he said. The bigger worry is about distraction, targeting an aircrew as it attempts to land a plane. Laser pointers range widely in power and capability. They include “cat lasers,” marketed primarily for digital presentations and playing with pets, which nonetheless can be used as a visual distraction up to 2 miles away. Larger hand-held lasers, known as “class four” devices, are more powerful and are capable of causing eye damage or even skin burns if used at very close range. The most damaging laser pointers are green, because the eye sees the color green as the brightest, Mr. Murphy said. Military officials avoid discussing what they are doing to mitigate against lasing attacks. Mr. Murphy said one of the main things pilots can do is get educated about attacks by lasers, including using them inside flight simulators. 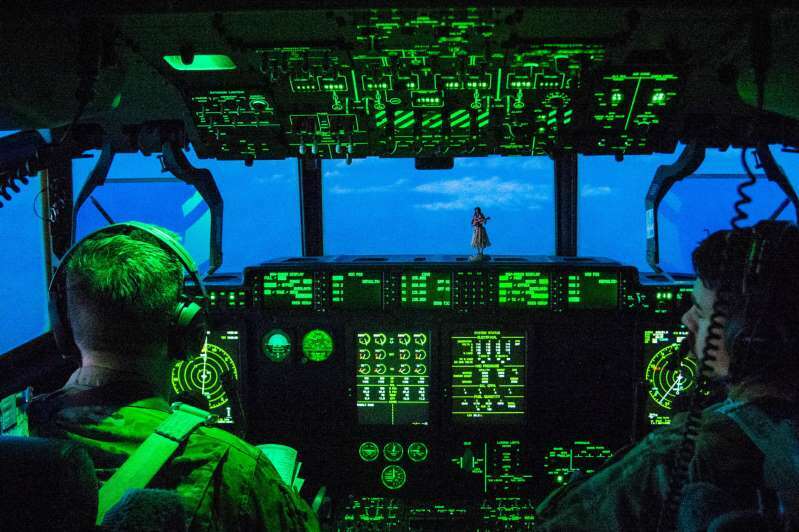 Pilots can train to manage laser attacks, and can use laser glare-protection glasses that can diminish the lasers as a distraction. Commercial firms also offer glare-resistant screens that may help reduce the effects of a laser beam.